Cutting down a tree or its branches is not an easy thing to do. Sawing tree limbs is one thing, but sawing them safely and ensuring the tree will stay alive is another thing. Most people are not aware of the safest ways to cut down a tree to the ground so that is why you need to call a tree surgeon. Tree surgeons are also known by the term ‘arborists’ and they specialise in tree-cutting and have good knowledge about the health of trees. If you have an old tree in your garden that looks in a bad shape, the best thing to do is call an arborist to take a look at it. 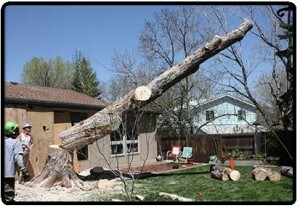 The arborist will make an evaluation of the tree and its roots and will suggest different solutions. Tree roots require regular watering, but there has to be good water drainage so that the tree does not get too much water and causes the tree roots to rot. Additionally, good mulching will keep the soil moist so it can keep all nutrients for the tree during the hot summer months. A skilled arborist can recognise the potential symptoms of tree disease and will know how the branches grow after cutting. Arborists are trained to recognise which places on the branch should be pruned in order to encourage new growth. Proper pruning will ensure the tree gets a strong structure that can withstand all kinds of weather conditions. A few things to consider when you look for an arborist is whether they have appropriate insurance in place, do they have quality equipment and know how to safely use it, and are they members of some professional organisation which guarantees they follow highest standards in their work. If they can say yes to all the above and this checks out, then you should get a professional and safe job. If you need help with the trees in your garden and need expert help, please get in touch.